Ozone Herbals Neem Bathing Bar is rich in essential natural micronutrients, antioxidants and vitamins. It helps calm and repair damaged skin. 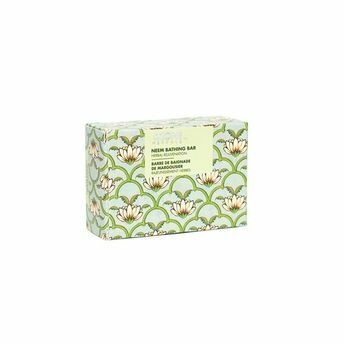 Enriched with Neem Oil, this Glycerin soap controls excessive oiliness, deep cleanses to remove impurities leaving skin clean, smooth, balanced and moisturized. It dramatically neutralizes toxins, improves skin texture and helps 'build' your 'beauty' from a flawless, pure and refreshed skin base. It has potent anti-bacterial as well as astringent properties to protect, heal, nourish and keep your skin soft, smooth and healthy.